Last week I got Bernard Cornwell's latest novel, Fools and Mortals, from the library and blitzed through it. It's an immensely enjoyable book and a quick read. Cornwell made his reputation with historical action adventures like the Sharpe series, following an English soldier in the Napoleonic wars, an the Uhtred series, set in Anglo-Saxon England during and after Alfred the Great's reign. He's also written standalone novels like Agincourt and Redcoat, set in crucial times and featuring lots of thrilling, well-executed action. His heroes are typically amoral badasses who are tough bordering on sociopathic but always do the right thing in a pinch. Fools and Mortals is vintage Cornwell is some ways and a departure in others. The characters are masculine tough talkers and there's plenty of grit to be found, and there is more than one fistfight and plenty of casual wench-ogling. But, as Cornwell himself has pointed out in interviews, not a single person dies in this novel, and the heroes aren't soldiers, but actors. And the protagonist dresses like a girl. Fools and Mortals takes place over the course of a few days in 1595. The narrator is Richard Shakespeare, baby brother to the Bard. Richard is ageing out of the female roles he has been playing and longs to have a man's part in one of his brother's plays. His brother is, in fact, working on two, which he believes to be among his best work. In the meantime, the brothers and the rest of their company, the Lord Chamberlain's Men, keep up a tedious schedule of rehearsals and performances and try to keep the Puritans from shutting them down. There are multiple subplots and threads of conflict running through Fools and Mortals (not unlike one of Shakespeare's plays), and Cornwell paces it all masterfully. Rival companies are trying to steal Shakespeare's new material so they can stage it first. The Puritans are looking for ways to shut down the theaters that have been built outside their jurisdiction in the City of London. The government's Catholic hunters are harassing everyone. Richard wants better roles, a permanent position with his tetchy brother's company of players, another chance to meet the fetching servant girl who works for the Lord Chamberlain's wife, and, in the meantime, he's barely paying his rent. Like A Midsummer Night's Dream, which Shakespeare and his company perform at the end, all these loose plots come together in the staging of a play to celebrate a wedding. A book with lots of subplots ending in a play with lots of subplots ending in a play—it's wonderfully meta in a way modern pop culture can't rival. Cornwell being Cornwell, there is no shortage of sneering religious hypocrites (an actual line from the villain: "In the name of the Lord, bend over.") and sniveling cowards as bad guys, but he keeps things pretty restrained. And there is a surprisingly sympathetic and moving portrait of an elderly Jesuit missionary living out the end of his life in the house where Richard rents a room. The book is full of period detail, especially when it comes to the staging of Shakespeare's plays themselves. And the theatrical aspect proved the most enjoyable and interesting part of the book to me. Cornwell got the idea for Fools and Mortals from summers he's spent acting with the Monomoy Theatre (you can see him as Prospero here), and his experience as an actor shows. The performances in the book are peppered with unexpected but vivid touches clearly drawn from life—for example, the different ways each player handles the stress backstage before a performance begins, the panic and irritation that come when someone forgets their lines, the way the actors feed on the energy of a bored, indifferent, or excited audience. It made me want to find the nearest theater performing Shakespeare and go sit down for a play as soon as possible. Fools and Mortals was a great read, a real labor of love for Shakespeare, and a treat for people who love Shakespeare's work. I recommend it. And, by the way, the two plays in the novel are A Midsummer Night's Dream, from which Cornwell gets the novel's title ("Lord, what fools these mortals be") and Romeo and Juliet. I won't reveal whether Richard finally gets his man's role onstage. By sheer coincidence, as I read Fools and Mortals for myself I also finished reading a young adult series I've been reading to my wife before bed each night. 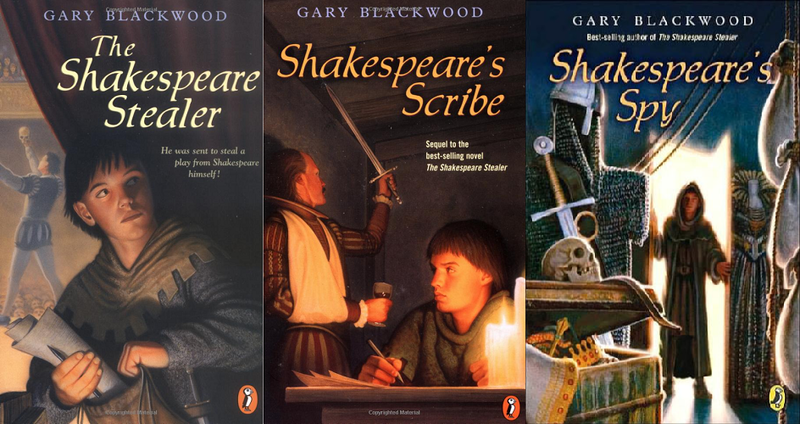 They're The Shakespeare Stealer, Shakespeare's Scribe, and Shakespeare's Spy, by Gary L. Blackwood. The series follows Widge, an orphan from the north of England, as he is first enlisted to steal from and then joins Shakespeare's players. The series takes place across about two years, from 1501-3, ending with the accession of James I. Along the way, Widge survives plague, works directly under Shakespeare, and becomes no mean player himself. He also develops a crush on Shakespeare's daughter Judith, who proves to be a high-maintenance tease, and rivalries with other boys in the company. Many of the same Elizabethan themes crop up in the series as in Cornwell's more recent book—acting, boys playing female roles, Puritanism and Catholic hunters, the cutthroat rivalries between acting companies, and more—but usually in a more kid-friendly way. The plots are more diffuse and not as tight, but Widge is an amiable narrator and good company to have on the journey. The series incorporates a lot of nice period detail and you get a really good sense of what London was like at the time. We really enjoyed Blackwood's trilogy and recommend it for your own reading, or if you have kids who enjoy a good historical story and might want to learn a little about Shakespeare, too.